Indianapolis is known for NASCAR racing, but it also has many other attractions for car lovers. Here are some of the places to visit if you love cars and everything about them. The Indianapolis Motor Speedway is a must-see for any car lover. It is home to the iconic Indianapolis 500 NASCAR Sprint Cup race and the Red Bull Indianapolis GP MotoGP race. The speedway is located at 4790 W. 16th Street, and you can buy tickets to the events right on their website. The annual Crown Royal 400 at the Brickyard is held in July every year and the Indianapolis 500 occurs in May of every year. This is the place to go when you want to find out the history of the Indianapolis Motor Speedway. Located at 4790 W. 16th Street, the museum features race vehicles and memorabilia. Take a guided bus tour of the grounds of the raceway, or take a lap around the 2.5-mile track in an IMS bus. Admission to the museum is $10 for adults and $5 for kids. It is open from 9 a.m. to 5 p.m. from March through October, and from 10 a.m. to 4 p.m. from November through February. The Lucas Oil Raceway is where you should go to see drag racing. It features a 1,300 m long dragstrip, and the drag race held at Lucas Oil is one of the oldest in NHRA history. This track also features stock car racing and the Carb Night Classic, which happens the night before the Indy 500. You can enjoy racing every week at this track throughout the spring, summer, and fall, and tickets are available right on their website. If you have ever dreamed of getting behind the wheel of a racecar, the Indy Racing Experience is a must. You can choose to ride or drive, and you can choose either an Indycar or a Stock Car. Drive around the track and reach speeds of up to 130 miles per hour, or have one of the experts drive you at speeds fast enough that you will feel the g-forces of a real race. You can also take part in a victory lap after a race at the Indy Racing Experience. The Indianapolis Auto Show is held the week after Christmas every year at the Indiana Convention Center. The event features over 450 different vehicles from over 40 car manufacturers. No matter what kind of vehicle you like to drive, you can see it at the auto show, whether it is an SUV, luxury car, or truck. The show also has concept cars so you can see what is coming with the latest technology, and you can talk cars with products specialists. 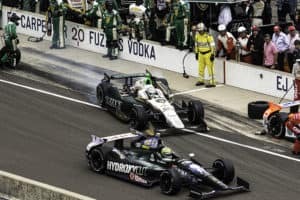 Whether you want to explore the history of racing, watch the cars in a race, or experience what it feels like to drive a racecar, there is something for every kind of car lover in Indianapolis.